Ovens Murray is perfectly placed where the undulating plains of central Victoria start to rise towards the peaks of Victoria’s alpine country. To the east is breathtaking natural spectacle and to the west is an important transport corridor, which means Ovens Murray offers lifestyle options as diverse as its topography. Residents can choose between the bustle of major regional cities, the charm of historic towns, and the serenity of open hills and snowfields. Diversity also characterises local employment opportunities in tourism, healthcare, education, recreation, farming, manufacturing and professional services. No wonder visitors flock to experience the lakes, rivers, mountains, festivals, food and wine of Ovens Murray. Ovens Murray includes the municipalities of Alpine Shire, Benalla Rural City, Indigo Shire, Mansfield Shire, Towong Shire, Wangaratta Rural City, and Wodonga City. The high country and snowfields, as well as the prominent water bodies and townships around the region, attract significant tourism activity. These areas also have recreational, historical and conservation values. The headwaters of many of Victoria's major rivers are located here and the availability of water close to its source is a major driver for high value agriculture, a softwood plantation industry and a vibrant tourism industry, based on snow sports, cycling, passive recreation, wine and fine food. Strengthening Mt Hotham, Falls Creek, Mt Buller and Lake Mountain as four-season destinations, along with more walking and bicycle trails and water-based recreation on the Murray River, will continue to grow the nature-based tourism sector in the region. The Hume Freeway and Melbourne-Sydney rail link through Wodonga provide a platform for freight transport and logistics industries along with passenger rail and bus transport. 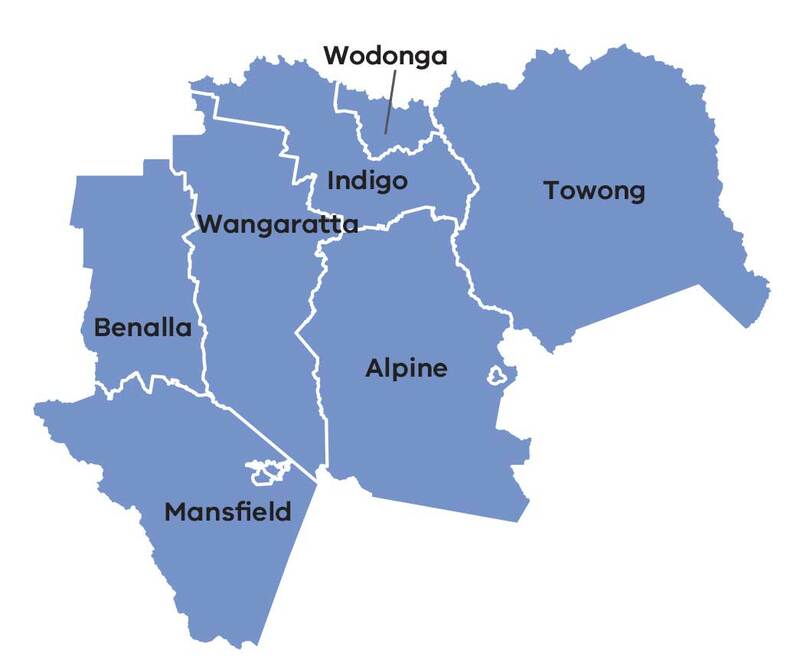 A particular challenge is planning for the growth of Wodonga and its peri-urban hinterland, whilst managing an ageing and dispersed population in the more remote areas of the sub region.